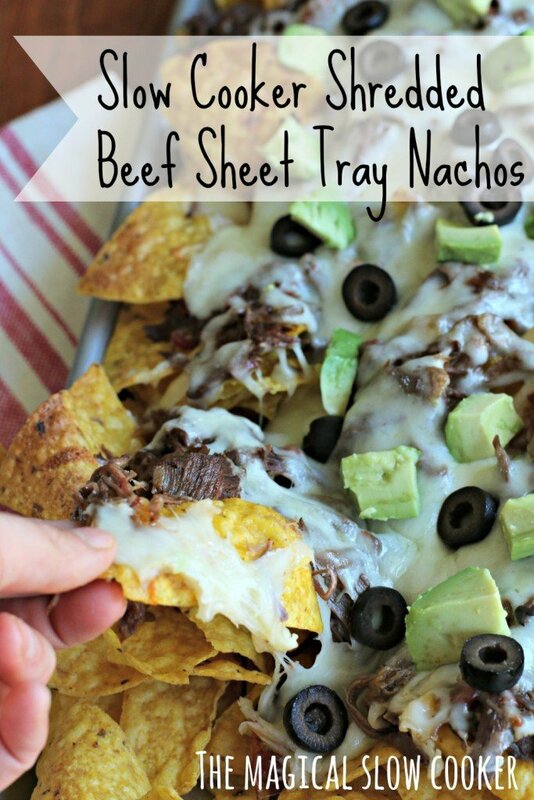 I am always looking for fun ways to entertain, this last weekend I made Shredded Beef Sheet Tray Nachos, these are perfect for Game Day! 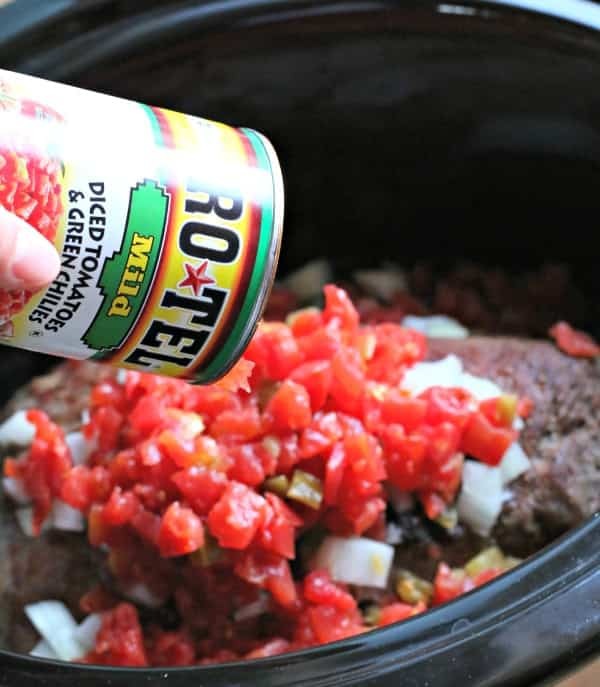 I used Rotel to spice up a chuck roast in my slow cooker. After the beef was done cooking, I made a sheet pan of nachos, enough to feed 8 hungry people! 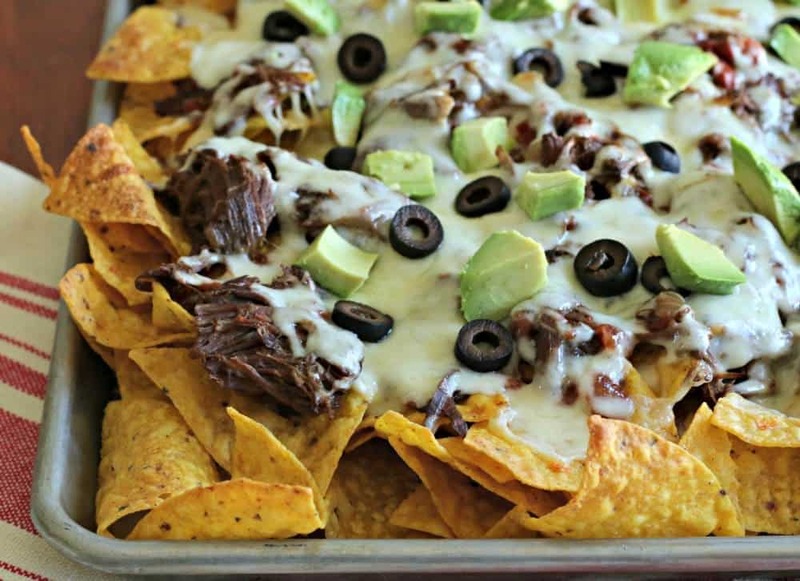 A fun way to serve this, is to put this giant tray of nachos on your coffee table while watching the game. Put some plates out, and salsa and sour cream for your guests to put on their own plates if desired. Put the nachos in the oven, it will take about 5 minutes for the cheese to melt. Remove from oven, add diced avocado and olives. Serve with sour cream and salsa if desired. Those nachos look delicious — that tray would be enough for me! This is perfect for a quick thrown together dinner/lunch/snack! It looks so good! These look so good! You totally inspire me to pull out my slow cooker! This sounds and looks so good! 🙂 Love the flavor that you packed into the beef. Oh, yum, this looks SO good! Great idea for the guys during the next basketball game. Good for a Beef Quesadilla also!